Clear furniture wax can be applied to protect the finish from minor spills; avoid mineral oil as its usage could discolor the wood. Wipe the table clean with a soft, dry cloth after each use. May 29, 2015 by Hayley W.
The Ella coffee table ended up being the perfect size for our u-shaped sectional. We have about a 60" or more space, so this table was a great fit. It is fairly lightweight and easy to move. My one complaint is that the top looks slightly "faux wood," but it's not something that would ever make us return the table. Several other websites offered this table, but Kathy Kuo had the best price by far. October 01, 2014 by Designer in T.
Over the moon with this gorgeous centerpiece in my living room makeover! So impressed with the price, ease of purchase & timely delivery. Thank you for providing the perfect piece to complete my look! Beautiful piece. Perfect compliment to our sectional sofa in family room. Sturdy table--well made. I was searching for a unique/rustic looking coffee table, and was so happy when I came across this one. It fits perfectly in my living room. It seems well constructed and is sturdy. I would definitely recommend using the clear furniture wax that the website suggests, as the table seems to show marks, but that should solve the issue! 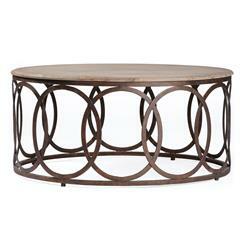 Interlocking circles round out the transitional Ella coffee table's iron base, delivering an industrial feel to living rooms in an earthy russet finish. Its aged oak veneer top completes the modern furnishing with organic appeal.